There are hundreds of enjoyable slots at Winner Casino and each week we choose a few to feature. 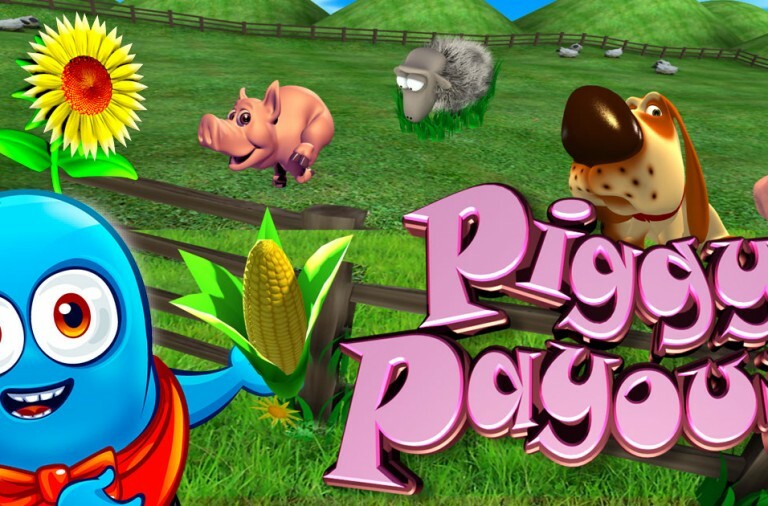 These games are chosen for a number of reasons, they may offer huge progressive jackpots, exciting bonus features or any other novel feature that makes them stand out. Take a look at this week’s games and find something new to play. The Matrix was released close to twenty years ago and immediately became a hit. The film is enjoyed to this day and it has been brought to the reels in this exciting slot machine complete with some fantastic features. 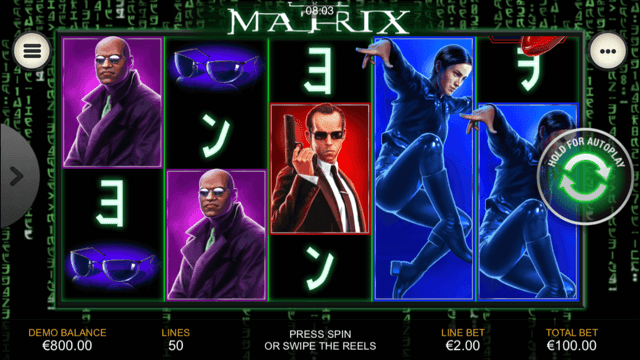 The Matrix is a 5 reel slot with 4 rows and 50 fixed paylines. The sound effects come straight from the film and the background is the scrolling green characters made famous by the film. There are five high value symbols, Agent Smith, Morpheus, Trinity, Smith’s sunglasses and a telephone. The lower value symbols are four programming characters. The slot features two wild symbols. The main one is Neo rendered in green characters, he can substitute for all the other symbols, except the scatter, to help and form wins. There is also a special déjà vu cat wild that can land on the fifth reel. The scatter symbols is ‘Free Games’ against a blue and red pill background. When the déjà vu cat wild symbol lands stacked on the fifth reel and covers the entire reel it is duplicated on the first reel. The rest of the symbols on the reels are then shuffled to produce a guaranteed win. The main bonus feature is triggered by landing the Free Spins symbol on reels one, three and five simultaneously. 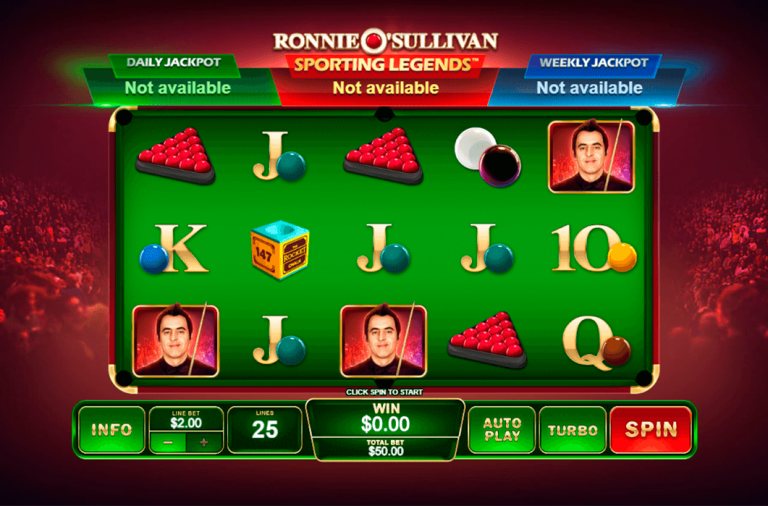 You are given the choice of two free spins modes. The Agent Smith mode gives you eight spins during which more Agent Smith symbols are added to the reels with each spin to help you land high value winning combinations. In the Nebuchadnezzar spins you receive unlimited spins with Sentinel wilds added to the reels. Each time a Sentinel wild lands it locks in place and the spins continue until there are six on the reels. However, a glowing EMP device can land on the reels and remove all the locked wilds to keep the spins going. You can bet anything from £0.50 up to £5,000 a spin on The Matrix so you can enjoy it no matter what your budget is. There is a huge top payout of 500x available for landing five wilds on the reels, Agent Smith can payout up to 250x, Morpheus can payout up to 200x, Trinity can payout up to 150x and the sunglasses and telephone can both payout up to 125x. If you enjoyed the 1999 film then you are sure to love this slot. Head over to the casino and give it a spin today. Fate Sisters – Will They Award You the Progressive Jackpot? The Age of the Gods series of slots is hugely popular for a variety of reasons. One of the games in the series is Fate Sisters, based upon the Ancient Greek idea of the three fates, and regardless of what you think about fate, the game offers some fantastic winning opportunities. 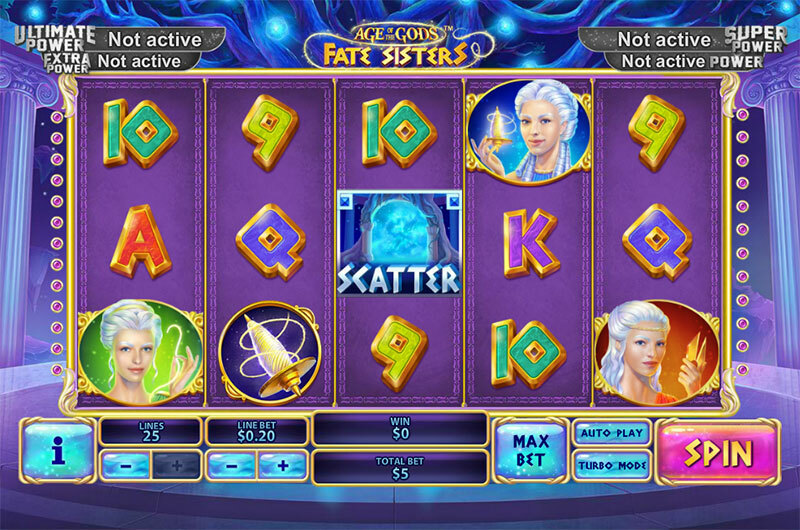 Age of the Gods: Fate Sisters is a 5 reel slot with up to 25 paylines. Behind the gold-rimmed reels you can see a gleaming circular area surrounded by pillars. The high value symbols include the three fates Lachesis, Clotho and Atropos and the various tools associated with them. The wild is a gold coin with a portrait of the three women on it, it can substitute for all other symbols, except the scatter to help and form winning combinations. The scatter symbol is a view of the moon through a window. As a base game bonus, if you can land Lachesis on reel one, Clotho on reel three and Atropos on reel five you are awarded a free re-spin with the fates frozen in place. During the spin the fates act as scatter symbols so as long as you land at least one more fate symbol you are guaranteed a payout. Atropos’ Temple – 15 free spins with dynamic multipliers. Each time Atopos lands on reels 1, 2, 4 or 5 the multiplier increases by 1x up to a maximum of 5x. If she doesn’t appear the multiplier decreases by 1x to a minimum of 2x. If she lands on reel three you receive three more spins. Lachesis’ Temple – 10 free spins during which wilds that land freeze in place for three spins. Landing Lachesis on reel three awards three more spins. Clotho’s Temple – 8 free spins with three random wilds per spin. Landing Clotho on reel three awards three more spins. 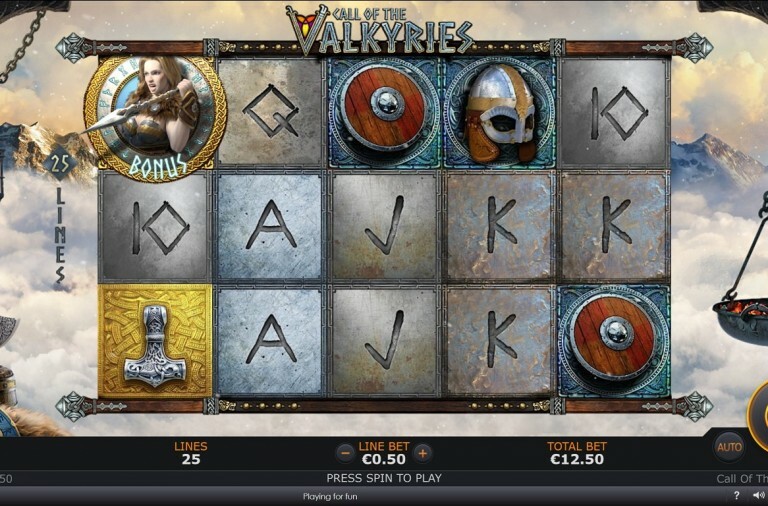 As the game is part of the Age of the Gods series it is linked to the Age of the Gods progressive jackpots. The jackpot game can begin at any point when playing and once it begins you are guaranteed to win one of the jackpots. In the jackpot game you will see a grid of gold coins (5 x 4) and need to click on them to reveal which jackpot they represent. Once you have found three matching symbols you win the corresponding jackpot. From largest to smallest the jackpots on offer are: Ultimate Power, Super Power, Extra Power or Power. With four progressive jackpots up for grabs and some truly rewarding bonus features this slot is guaranteed to provide hours of fun. 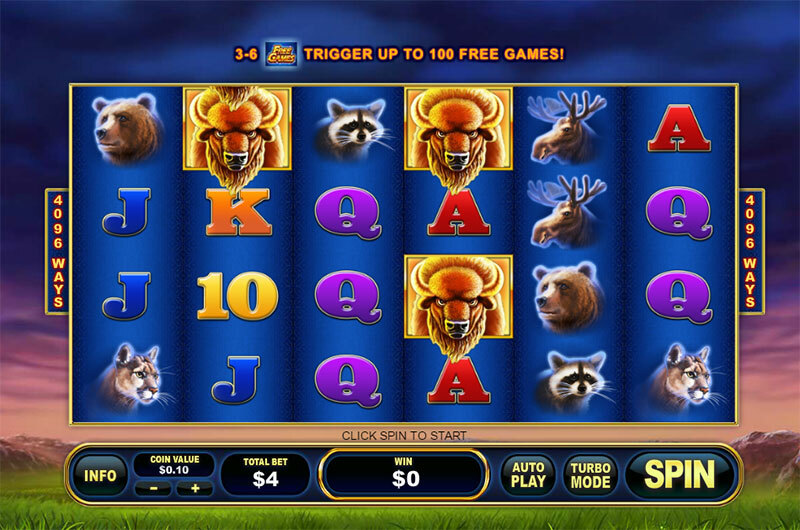 The buffalo is one of nature’s biggest animals and it is appropriate that the slot machine dedicated to it is bigger than you average slot with more reels and more paylines. Furthermore, the slot gives you the chance to win some truly huge payouts. Buffalo Blitz is a 6 reel slot that has 4 rows and an incredible 4096 ways to win. Thanks to this, as long as you land matching symbols from left to right across the reels you will win a payout. Best of all the high value symbols payout when just two land so it is extremely easy to land wins. Behind the reels is a view of a dusky sky over a green landscape. The high value symbols are five animals: buffalos, lynxes, raccoons, moose and bears. The buffalo symbol is the most valuable and it can land stacked on the reels to help you form wins. There is a large blue diamond wild symbol that can land on all the reels except for the first. It can substitute for all the other symbols except the Free Games scatter to help and form winning combinations. If you land three, four, five or six Free Games scatter symbols anywhere on the reels you will win 8, 15, 25 or 100 free spins respectively. During the free spins whenever the wild symbol contributes to a win it will award a random multiplier of 2x, 3x or 5x. Furthermore, it is possible to win more free spins by landing additional scatter symbols. If you land two more scatters you will receive 5 more spins and landing three, four, five or six will award you with 8, 15, 25 or 100 more spins respectively. To aid your gameplay there is a Turbo mode and an Auto Spin feature so that you can sit back and watch the wins roll in. While this is a huge game it doesn’t cost a fortune to play thanks to a betting range of £0.40 up to £200 per spin. The buffalo can award the top payout of 300x when six land on the reels, the lynx and racoon can both payout up to 250x and the moose and bear can payout up to 200x. Remember, in the free spins all of these payouts could be multiplied by five if a wild symbol forms part of the combination. If you enjoyed this weekend’s selection of featured games then be sure to check back as we pick more games on a regular basis. Remember, there are hundreds of slots to enjoy at Winner Casino and the collection is incredibly diverse so you will always have something new to discover and more ways to enjoy some massive wins.